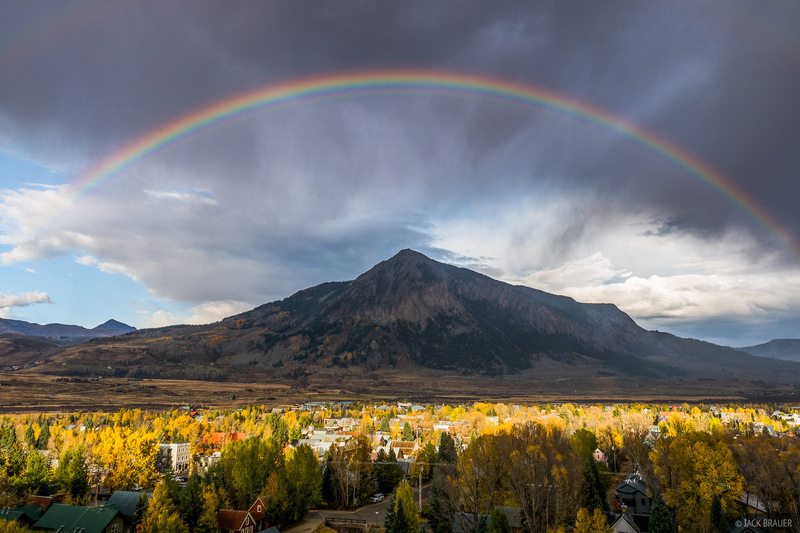 A rainbow shines over the town of Crested Butte, Colorado – October. 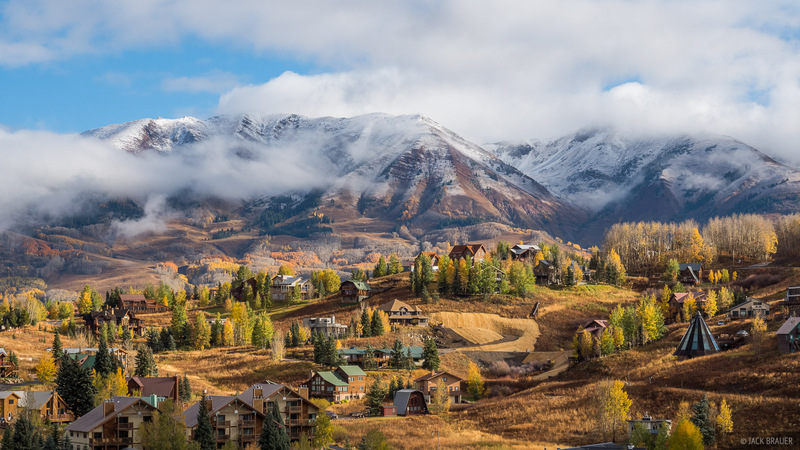 Posted in Colorado and tagged Colorado, Crested Butte on October 12, 2015 by Jack Brauer. Hiking on Mt. Owen in the Ruby Range, high above the aspens of Kebler Pass, Colorado. Hiking along the south ridge of Mt. Owen with a sun halo above. Mt. 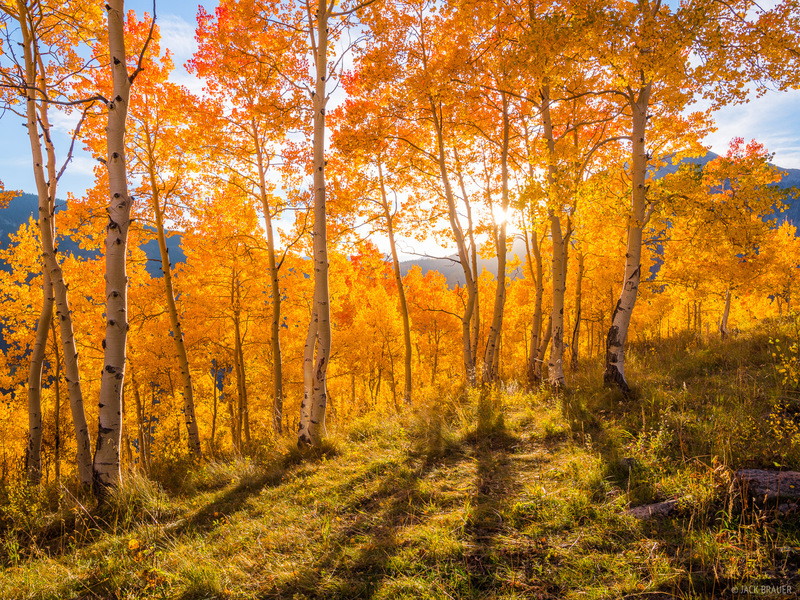 Crested Butte and colorful aspens in late September. A colorful sunset above Mt. 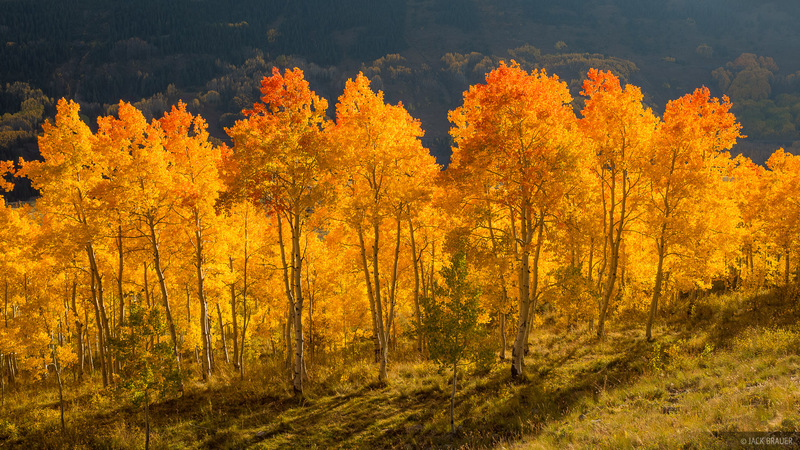 Crested Butte – October. First snow dusting the Elk Mountains as seen from Mt. 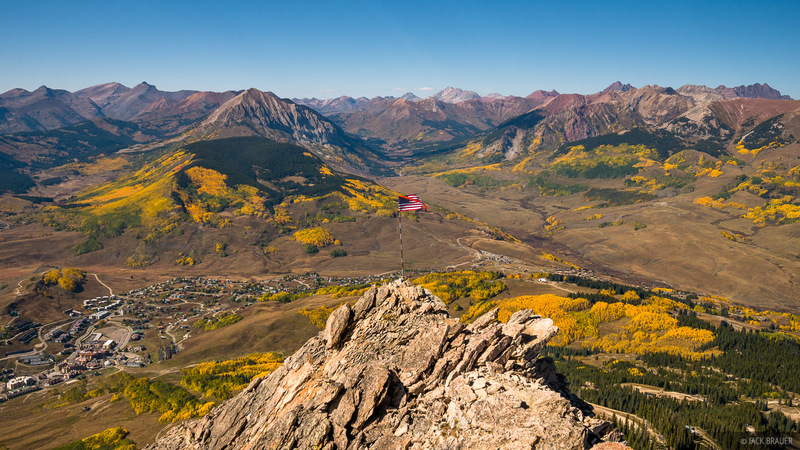 Crested Butte – October 6. 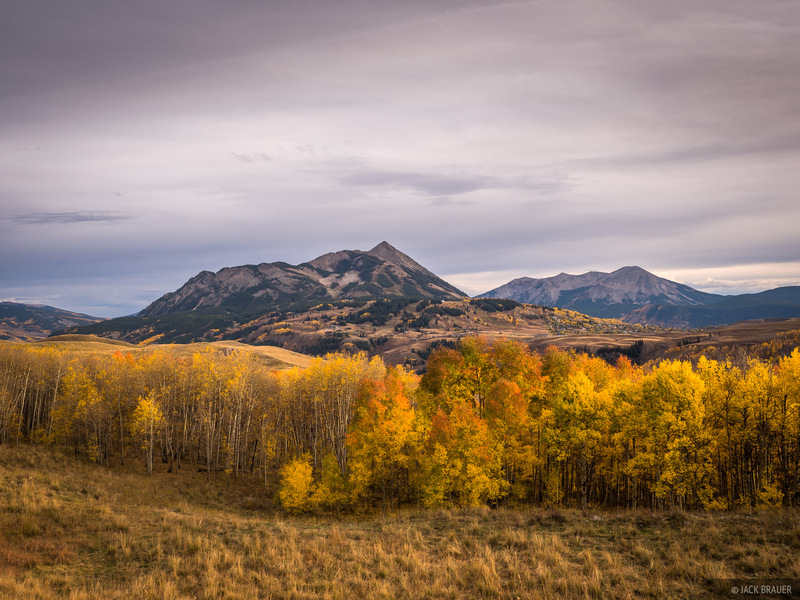 Posted in Colorado and tagged Colorado, Crested Butte on October 6, 2015 by Jack Brauer. Mt. 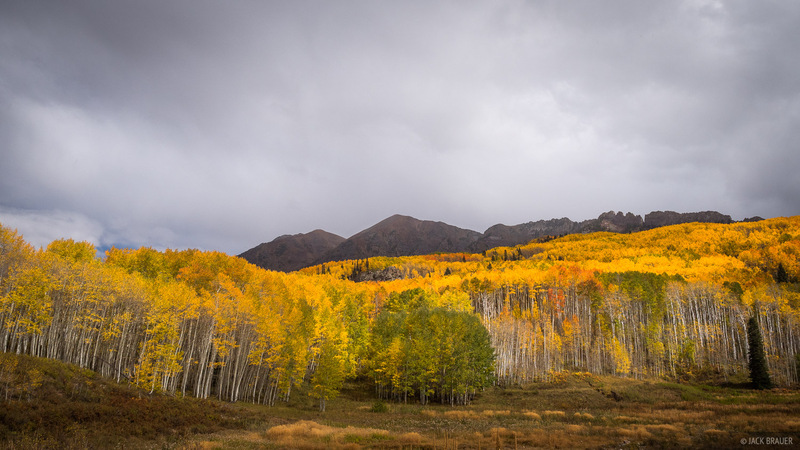 Crested Butte and golden autumn aspens on a cloudy September day, Colorado. 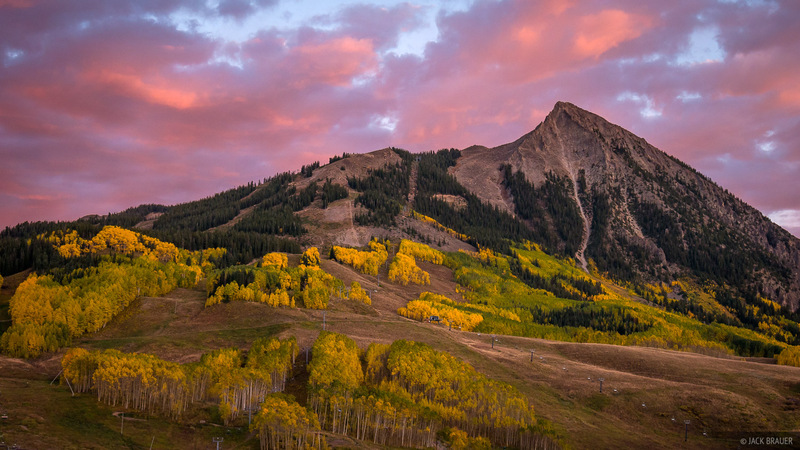 Posted in Colorado and tagged Colorado, Crested Butte on October 1, 2015 by Jack Brauer. Fiery reddish-orange aspens brilliantly backlit by the setting sun. 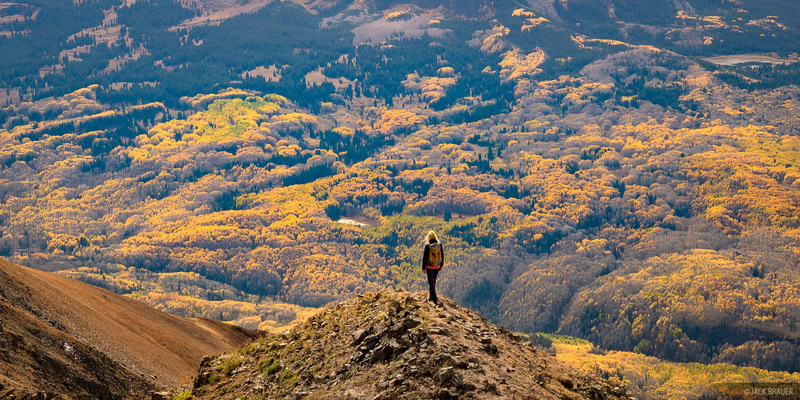 Crested Butte, Colorado, September. I had great fun yesterday with my buddy Dave Showalter tromping around in the forest searching for the craziest aspen colors we could find. We certainly found plenty! 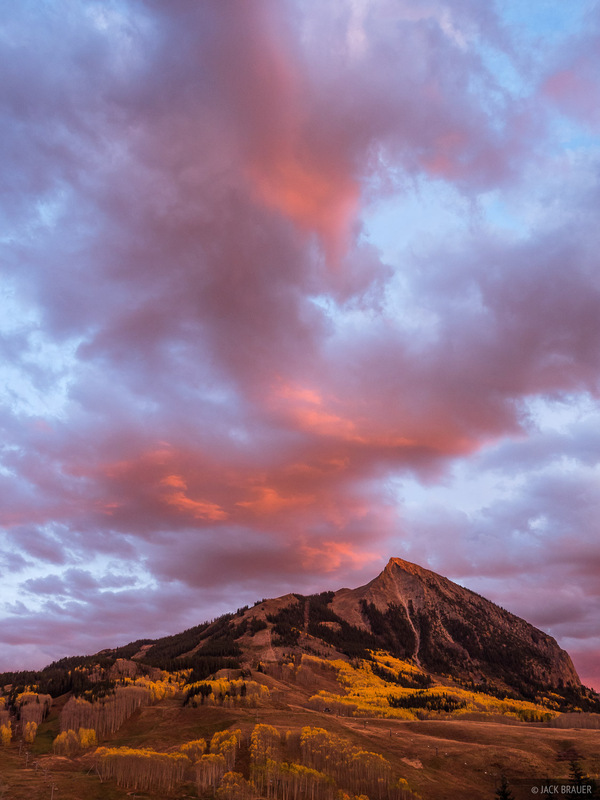 Posted in Colorado and tagged Colorado, Crested Butte on September 28, 2015 September 28, 2015 by Jack Brauer. 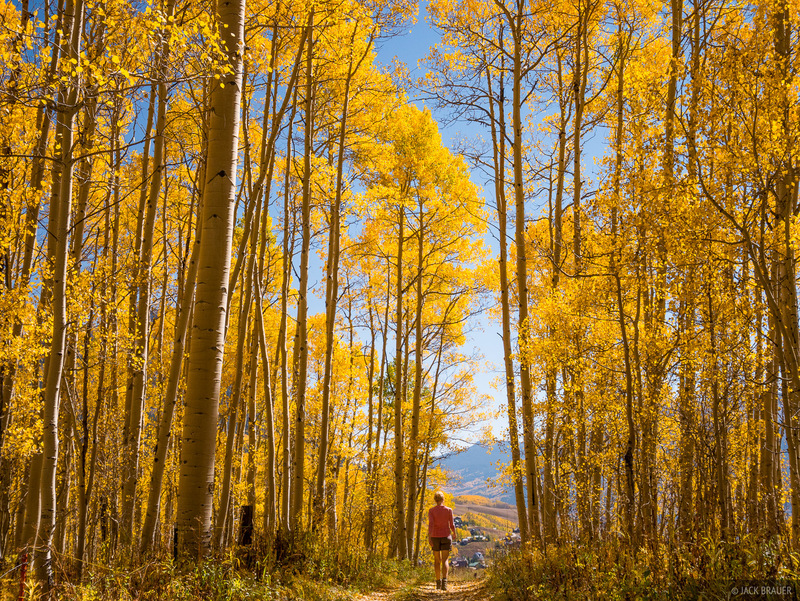 Walking through a golden aspen forest near Crested Butte, Colorado in September. 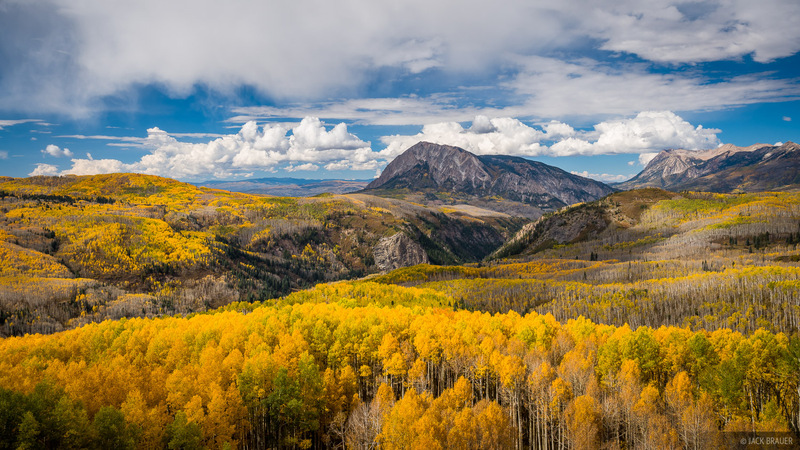 Posted in Colorado and tagged Colorado, Crested Butte on September 27, 2015 by Jack Brauer. Beginning a new chapter in our life together, Claudia and I have moved from Ouray to Crested Butte! As much as we love Ouray and the San Juans and all our friends there, after much contemplation we decided that we should try living in a bit larger town where Claudia would have more opportunities. I’ve always loved the Crested Butte area and Claudia was really attracted to it as well last time we were here (it’s hard not to be). And it also doesn’t hurt that there are coffee shops and bicycles everywhere! Although the rental market is tough in Crested Butte (like most ski towns in Colorado), we ended up finding a nice condo up at Mt. Crested Butte which is a sort of condo-village right near the ski resort base area and only about a 5 minute drive from the town proper. From our terrace we have a panoramic view of the actual Mt. Crested Butte, the ski area, and the Elk Mountains! We celebrated our first morning here by hiking up to the top of the Butte to see the lay of the land. View from the 12,162 ft. summit of Mt. 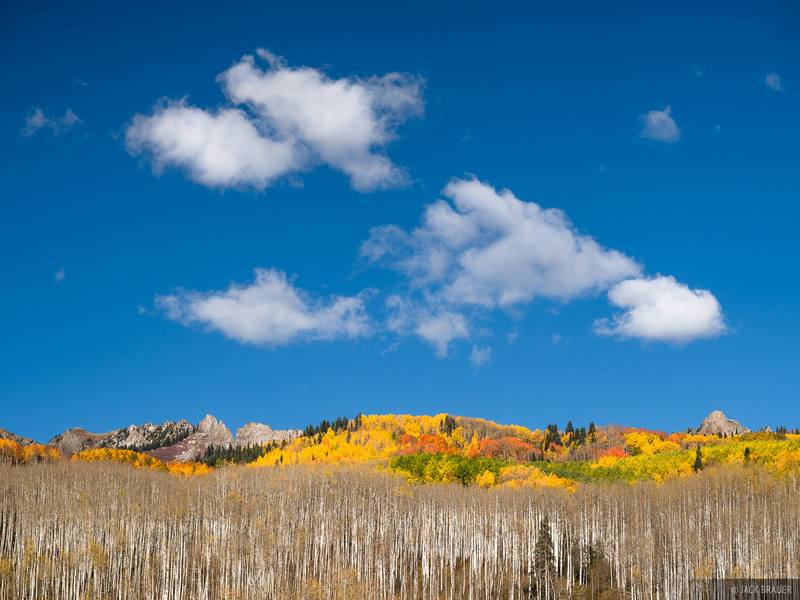 Crested Butte – September. Gothic Mountain is the prominent peak at center-left. To the right are the Elk Mountains; you can see the summits of Snowmass Mountain, the Maroon Bells, and Pyramid Peak sticking up higher than the rest. Our condo building is visible down there on the very left side of the photo. A roughly 180º view from the summit of Mt. Crested Butte. The town of Crested Butte is down at the left; the village of Mt. Crested Butte and the ski area base are down in the center. The aptly named Mt. Crested Butte is indeed a butte with a pointy crested top, rising solo in the center of a broad basin ringed by mountain ranges on almost all sides. 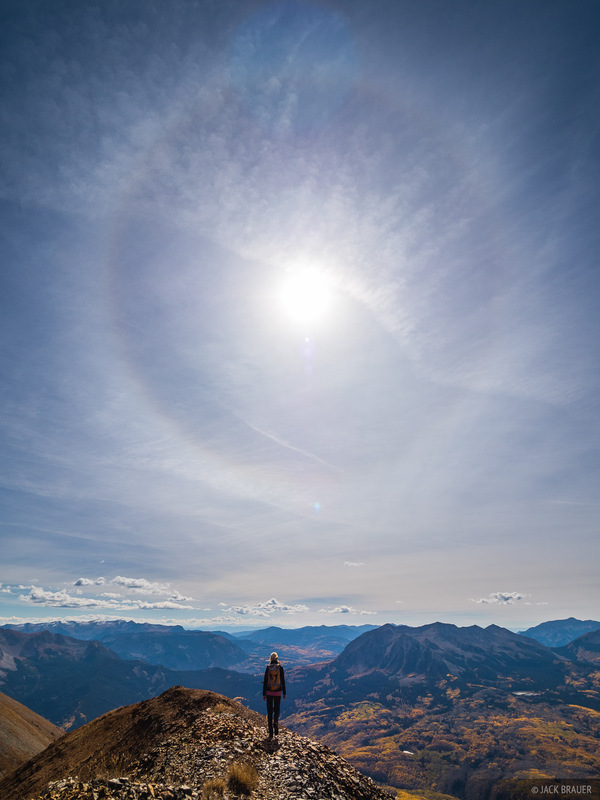 From the 12,162 ft. summit you see mountain valleys radiating out in all directions like the spokes of a wheel. There’s a distinct feeling of spaciousness around here; although I’m probably more aware of this having lived in the deep box canyon of Ouray for the last 8 years. A colorful autumn sunset over Mt. 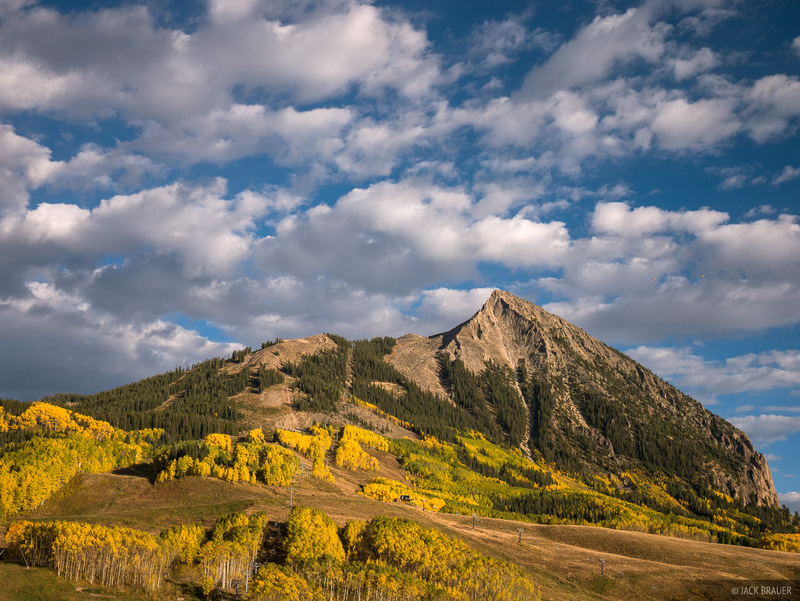 Crested Butte – September. Packing up our house and leaving Ouray was a tough choice to make but now that we’re here I’m super stoked. We’ll be here at least through May and maybe we stay for good, maybe we go back to Ouray; we’re just playing it by ear and making the most of it wherever we are and wherever we end up. Posted in Colorado and tagged Colorado, Crested Butte, Elk Mountains on September 25, 2015 September 25, 2015 by Jack Brauer. 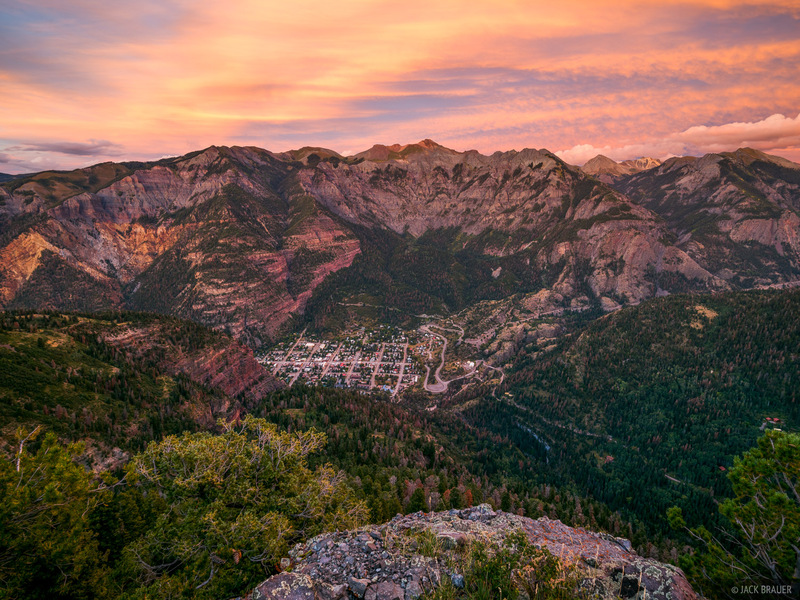 A brilliant sunset high above the town of Ouray and the San Juan Mountains, Colorado – September. Yesterday evening I was lucky to witness and photograph a fantastic sunset from one of my favorite overlooks of Ouray. This is a seldom visited spot that requires a steep bushwhack and an exposed scramble up crumbly cliffs to get to, but the reward is what I consider one of the best vantage points over the Ouray valley. I’ve been up here probably two or three times before, but never got so lucky with the sunset light! The next week or so will be our last in Ouray at least for a while, so when I’ve been going on hikes recently and seeing such scenes (like this, and the rainbow last week), I can’t help but feel that the San Juans are smiling upon me, giving me a good sendoff! I know it’s dumb to think that way, but maybe I’m just getting a little sentimental! Posted in Colorado and tagged Colorado, Ouray, San Juans on September 8, 2015 September 8, 2015 by Jack Brauer. 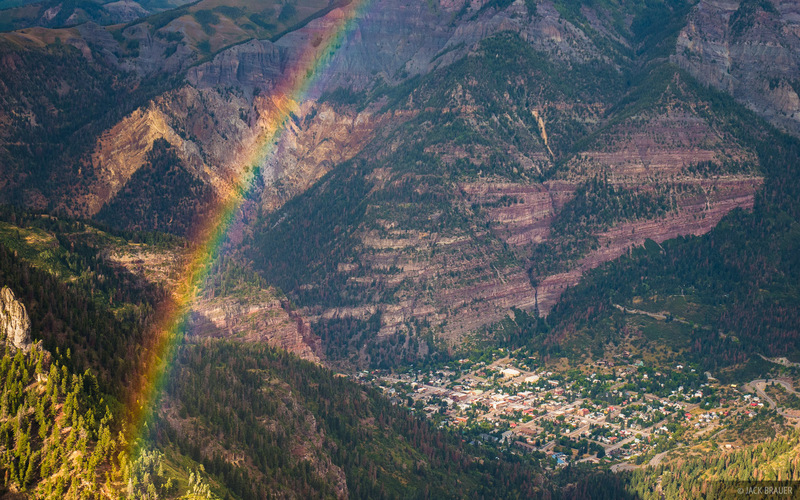 A rainbow shines over the town of Ouray in the San Juan Mountains, Colorado – August. Posted in Colorado and tagged Colorado, Ouray, San Juans on September 1, 2015 by Jack Brauer.